For all undergraduate, postgraduate and school-based routes to qualified teacher status, Learning to Teach in the Secondary School is an essential introduction to the key skills and knowledge needed to become a secondary teacher. Underpinned by evidence-informed practice and focussing on what you need to know to thrive in the classroom, the eighth edition is fully updated in light of changes in the field, covers new topics and provides additional guidance on topics such as developing your resilience, using digital technologies, closing the achievement gap and using data to inform your teaching and pupil learning. The text includes a wealth of examples and tasks to demonstrate how to successfully apply theory to practice and how to critically reflect on and analyse your practice to maximise pupil learning. The wide range of pedagogical features supports both school- and university-based work up to Masters level. Written by experts in the field, the 37 concise units create unit-by-unit coverage that can be dipped into, offering guidance on all aspects of learning to teach including:Managing your workloadLesson planningCurriculumMotivating pupils Promoting behaviour for learningAssessment, marking and feedbackSpecial educational needs and disabilities (SEND)Applying for jobs, developing as a professional and networkingLearning to Teach in the Secondary School provides practical help and guidance for many of the situations and potential challenges you are faced with in school. The text is extended by a companion website that includes additional information as well as specific units covering England, Northern Ireland, Scotland and Wales. 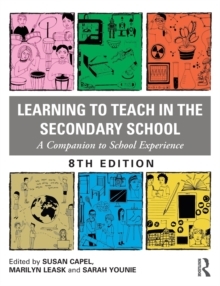 Supported by the subject-specific titles in the Learning to Teach Subjects in the Secondary School Series, it is an essential purchase for every aspiring secondary school teacher.